The incorporation of green plant tissue into the soil is an ancient practice known as ‘green manuring’. 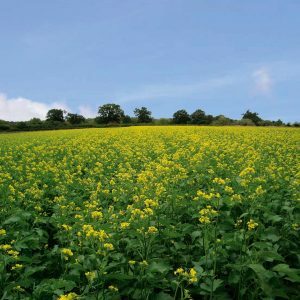 Our green manure products have been bred specifically to produce large quantities of biomass and contain high levels of the specific desirable glucosinolates and enzymes required for the biofumigation process. Caliente Rojo is the latest biofumigant mustard from ISCI in Bologna, Italy. Manage nematodes & pathogens, and build up soil quality. It has been bred to produce up to 10% more Isothiocyanates and even more biomass in a shorter growth period than our most popular and proven variety Caliente 199. Hottest variety, giving the best biofumigant action due to very high levels of glucosinolates (30% more ITC than our previous basis Blend 119). Fertiliser inputs and irrigation are essential for best results from this variety. Recommended seeding rate: 8-10 kg/ha. Timing for incorporation is key for maximum effect. For March to June sowing this normally coincides with flowering. 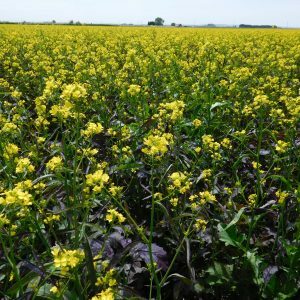 For later sowing, in July and August, incorporation should be made at the right stage for maximum green biomass which might not be when it’s flowering. Incorporation requires moisture to release gases in the biofumigation process; irrigation should be considered if conditions are not suitable.